I know I’m often posting strangers I found in Taiwan. Does it mean that Taiwanese are pretty open to have their pictures taken? I’d say, yes. Taiwanese are friendly and very polite people, still being interested in strangers crossing their way. Or is it the fact that wherever I travel, I bring stories back. Even though these stories seem trivial and not earth-shattering, they do count for me and maybe a little for the readers here as well. I met Hinata while doing my usual Saturday walk through Taipei. She was with a group of people hanging out around a 5×4 Speed Graflex on a big wooden tripod. They were taking instant portraits of people who wanted a little cute souvenir to remember the day. They had set up their little outdoors studio in the middle of the busy Xi Men shopping district. I watched the procedures for a while and decided to have my picture as an angry German tourists taken as well. I hang my Yashica FRI around my neck looking as angry and frustrated as possible. My co-worker Giovanni decided against it just watching the hype the young people with their analog camera produced. I got my picture glued on a heavy carton with place and date written underneath in Chinese. I do look a little fat but that can’t be blamed on the graflex, the impossible instant film, nor the photographer. Hinata is Taiwanese, married to a Japanese guy, and living in Taipei. When I told her about the 100strangers project, she agreed to have her image taken. I sent her an email with the two images but haven’t received any reply. I also can’t find any information about the project online. A wall higher than the Berlin wall still exists in today’s world of google and facebook: the language wall, especially between Chinese and English. Whatever keywords I search, they might just not be in the right language. 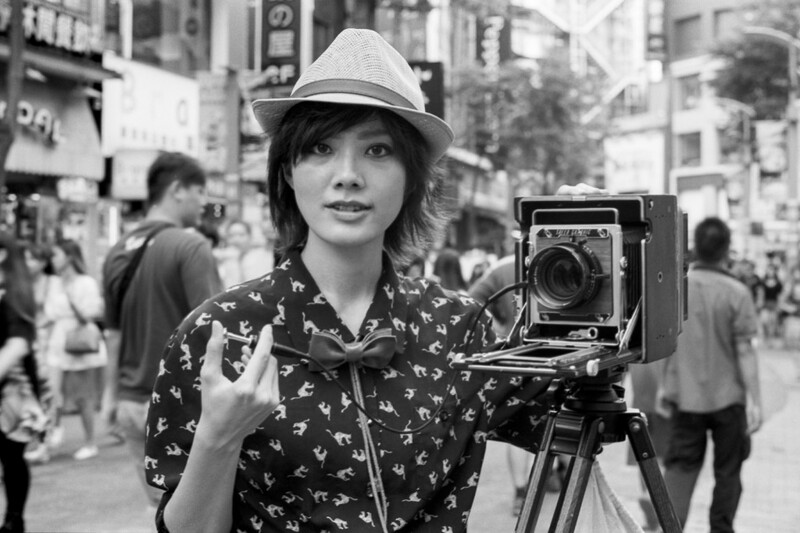 Next time you visit Taipei, stop by the Xi Men district, get some bubble tea and let Hinata take your picture. PS: I finally did find something and you can see it’s mostly in Chinese. However, check out the link here. that’s indeed a marvelous post. i hope she sees this blogpost and likes it as i do. p.s. i think this is the official facebook page of this project: https://www.facebook.com/Mafeien/timeline via facebook login you can at least let fb tranlate the posts for you. Nice one, like it much..! And now the question is where can I see that photo of the german tourist? Thomas, “the angry german tourist” … it’s not a digital image, so you need to visit. Maybe for Octoberfest?